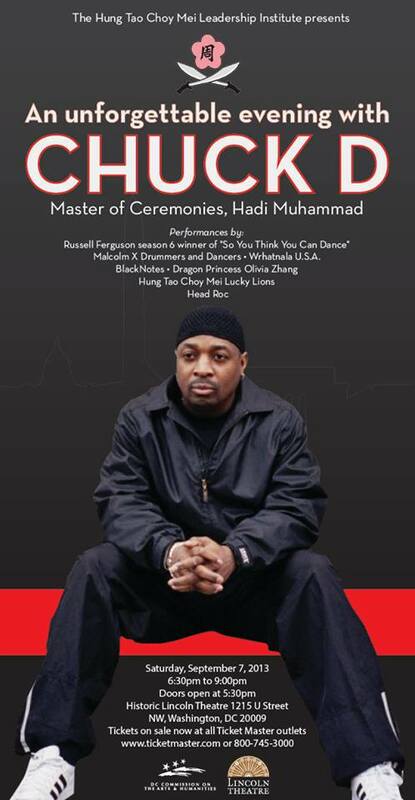 Hip-Hop Icon Chuck D of Public Enemy is coming to town this Saturday September 7, 2013 to receive the Paul Robeson "Here I Stand" Award from the Hung Tao Choy Mei Leadership Institute at the historic Lincoln Theatre. Past recipients of the award include other entertainment legends like Harry Belafonte, Rita Moreno, Spike Lee, and Common. 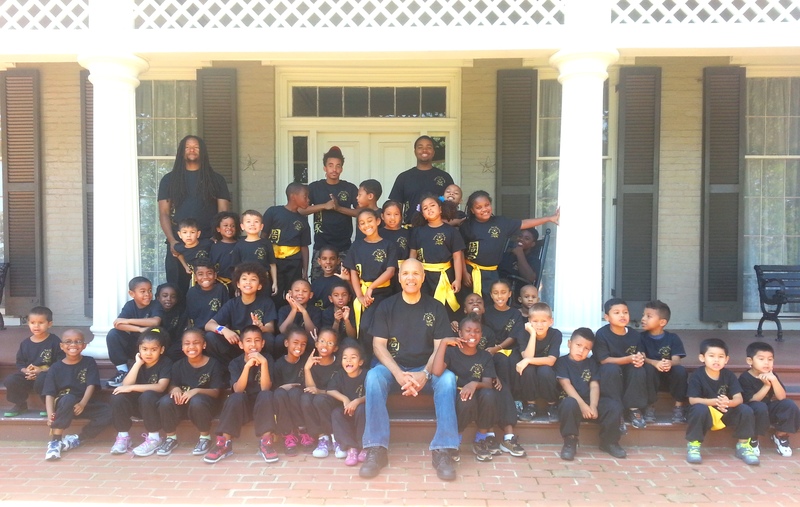 HTCMLI is run by Sifu Addur-Rahim Muhammad, a Martial Art's Master of 43 years trained in the Jow Ga system of Kung Fu under Master Dean Chin. He owns and operates the Hung Tao Choy Mei Kung Fu Academy located at 1351 U Street NW, one of the few Black businesses to remain on U Street in this current era Chocolate City's economic development. Sifu Rahim, as I call him, is a longtime community activist and authentic leader in the Black Community. His website www.martialactivist.org, is HTCMLI's online headquarters. I have had the pleasure to work with him on several occasions, first on March 9, 2004 (the date Notorious B.I.G was slain) on his "Healing Ourselves -- A Health and Wellness Call to Action" program, also at Lincoln Theatre, to promote "alternative choices for healthcare, fitness and overall well-being" in Washington, D.C.'s troubled communities. HTCMLI is dedicated to promoting the traditional role and legacy artist activists have played promoting a more just society. I am honored to say that, being considered an artist activist in my hometown, that I consider Sifu Rahim to be a mentor. And if you don't know already, it's a DOUBLE honor to be performing just before Chuck D comes out on stage this Saturday to receive his Paul Robeson "Here I Stand" Award. Chuck D! Public Enemy!! Possibly, no -- definitely the most culturally influential Hip-Hop group of all time! For his role as lead MC in Public Enemy, Chuck D is the pure definition of an artist activist. His lyrics are and forever will remain timeless. Songs like "Fight the Power" and "Don't Believe the Hype" were global commercial hits in the age where record companies were not fully aware of the power of Hip-Hop music as a unifying voice for disenfranchised people globally. Chuck D and Public Enemy sold out arenas on an anchor of unapologetic Black Power music for many years; were famous and infamous, loved and vilified, for doing so. No matter whether you agreed or disagreed with the group's politics, you knew who Public Enemy was, and are even today. Flanked by the best hype man in business and the unforgettable, not to mention controversial, Flava Flav; Minister of Education and the eventual scapegoat for Public Enemy's commercial decline Professor Griff; and Cut Master Terminator X (DJ), Chuck D articulated the continuing plight of Black Americans to the outside world. At their apex, Public Enemy represented a resurgence of the political and social consciousness that was the hallmark of 60's and 70's era Funk music. Their song "Fight the Power" is the second coming of that sentiment popular amongst oppressed people everywhere. The first "Fight the Power" (as I know it) was recorded by the Isley Brothers back in 1975. Both songs have the same message, and also common to both is the way people all over partied and danced to activist artist penned, socially conscious, commercial grade manufactured, marketed, and promoted Black Music worldwide. And for doing so in Hip-Hop, as a master of the rhythm and rhyme, performance and delivery, Chuck D is indeed an international rock star! Yet, Public Enemy was of course fronted on many U.S. mainstream and commercial award shows for their brand of high achievement in the entertainment industry. That said, and this year none the less, Public Enemy was officially inducted in the Rock N Roll Hall of Fame. These successes are only a fraction of Chuck D's legacy, and all these many years later he is still very much an artist activist. He has weathered the storm of criticisms, negative propaganda and boycotts by conservative American culture and powerful institutions the like. He is a star in Hollywood with several movie and documentary appearances to his credit, while still traipsing the earth giving talks and lectures, and yes, Chuck D is still performing his art. I had the surprise pleasure to meet Chuck D in the most unlikely of places. Last spring, at an airport in Yakima, Washington I and Dr. Jared Ball met Chuck D along with his wife as they were leaving the "22nd Annual Students of Color Conference", for which we were arriving to deliver keynote presentations. I've met a few Hip-Hop Gods in my time, and am rarely star struck. That day, upon meeting Chuck D, I was speechless. And now, I will be rocking for him and everyone in attendance this Saturday September 7th at the Lincoln Theatre for which he will receive an award from one of my mentors. Along with the fact that I have penned lyrics that speak his name in my repertoire, plus I actually got to play Chuck D (in a way) during the Adrinka Group's production of "The Greatest Hip-Hop Cover Story Ever Told" a few years back -- I almost can't believe what's to come this Saturday. It will no doubt go down as one of the highlights of my thus far 20 year career as a Hip-Hop artist and artist activist. That's Chuck D. Most people reading this article know about the Brother, and if you don't, just google him. In my opinion and mission, as equally important and deserving of praise are those who do work that directly affect people here Washington, D.C. -- our rock star artist activists who put boots on the ground to advocate for our communities of culture. Sifu Rahim is most certainly one of those people. I learned the term "authentic leader" during my residency with the Highlander Center earlier this year. Paraphrasing, an authentic leader is someone the community respects off the bat. Becoming an authentic leader is not something that happens in an instant. That distinction is earned over years of dedicated involvement in what is commonly and reverently referred to as "The Struggle". And while it's obvious that I hold Sifu Rahim in high regard, as I write this piece I realize I really don't know that much about what has led him to this point, where he himself is a D.C. Institution, bringing a Global Icon to Washington, D.C. to be honored with an award. By way of Sifu Rahim's vision, the award is aptly named after the first international entertainment super star and epitome of all artist activists: The Paul Robeson "Here I Stand" Award. Seeing as though this blog is getting long, I'll have to come back around and do that interview with Sifu Rahim later. That notwithstanding, just on the strength of his demonstrated authentic leadership, when Sifu Rahim calls I, along with a community of others who are connected with him, have no problem feeling obliged to show up. Call that kind of loyalty a testament to Sifu Rahim's countenance, of which I have experienced and benefited from on many levels in my time of knowing him. For full disclosure as I wrap up this piece, this summer, Sifu Rahim appointed me the Arts Director of the Hung Tao Choy Mei Kung Summer Camp. He brought me in to work with Chocolate City's most precious resource, our children. I had the wonderful experience to do a modified version of my Hip-Hop writing workshop with 20-30 of D.C.'s youth of Elementary school age. It was amazing, with the final product being a song he asked me to write extolling the virtues of the Hung Tao Choy Mei Leadership Institute as a place of community trust; instilling and nurturing empowerment of our underserved communities in Washington, D.C. There is a rough cut video on YouTube that includes some footage from summer camp class activities and field trips. Russell Ferguson season 6 winner of "So You Think You Can Dance"
*Shout out to Wuiping Yap who will be the Stage Manager Saturday night keeping things running tight, and is a huge contributor the nuts and bolts on many events the Hung Tao Choy Mei Leadership Institute produce.